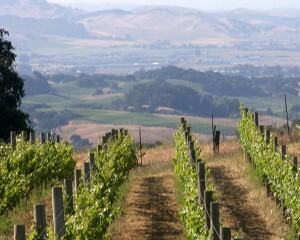 High above the floor of the Napa Valley, the Brandlin vineyards drained well during 2011’s damp summer. With nearly all of the Napa Valley’s 2011 Cabernet Sauvignon now released, critics agree that the unusually cool and wet summer yielded a slew of ordinary wines – – and yet others which mirror the great cabs that defined the region some three decades ago. Indeed, big producers with vineyards that didn’t drain well ended up with sub-par fruit, at least by Napa Valley standards. Smaller producers such as Cuvaison – – which handcrafts the Brandlin Estate Cabernet Sauvignon with grapes from its Mount Veeder vineyards – – made softer and more complex wines straight out the 1980s, ones that may actually age longer and better than more recent vintages. Call it the Year of the Throwbacks. Northern California summers typically have enough sun and warmth to produce harvests that allow vintners to purposefully make just about any style of wine desired. But Napa Valley earned its early reputation with Cabernets analogous to the subtle terroir-influenced wines of Bordeaux, where unpredictable weather always has a variable impact on the finished product. Today’s most acclaimed Napa cabs are invariably big, with a relatively high alcohol content and a jammy thickness that hangs on a receptive palate. It’s what impresses and sells at the high end of wine. However, in the summer of 2011 Mother Nature simply didn’t cooperate. From June onward a true summer never fully developed. October brought rain that not only further delayed the harvest, but forced growers and vintners to dump grapes with signs of mold or rot. Some still tried to make the monster wines, others didn’t bother to send releases to critics. But a few others rolled with the conditions of the season. Founded in 1969, Cuvaison prides itself on block-by-block farming methods, and a hands-on vineyard-to-bottle winemaking approach. Its proprietary grapes come from Mount Veeder and from vineyards in the Carneros American Viticultural Area just North of San Pablo Bay. Its wines typically favor nuanced nose and taste notes over brute ripeness and power. Consequently, 2011’s weather was right up Rogstad’s alley. San Francisco Chronicle wine editor Jon Bonne called it “a great snapshot of the Brandlin family’s historic plot. Give it air to mellow the camphor and oak notes that come first . . . and find juicy mulberry and currant fruit, plus black olive, and a classic Veeder vitality to the tannins.” The Brandlin 2011 Cabernet retails for $60 and is 14.5 percent alcohol.